Home Mobile Iphone Forget the next iPhone. Who could be Apple’s next iCEO? Welcome back to Tech Chronicle. Want insight after insight in quick succession? Try subscribing and you’ll know what’s coming next. Apple is once again the world’s most valuable company, and Tim Cook deserves more than a fair share of the credit. Many questioned whether he could lead the company after the death of co-founder Steve Jobs in 2011. That’s no longer the question about Cook. In a new biography of Cook, subtitled “The Genius Who Took Apple to the Next Level,” writer Leander Kahney suggests that Cook is actually a better CEO than Jobs — or at least a better CEO for the period after the introduction of the iPhone, when perfecting supply chains and layering services on top of hardware and software were the key challenges for the company. If that’s the case, Jobs did one thing particularly right. He picked Cook to succeed him as CEO. And that is — as far as Apple investors and the public are aware — an area where Cook has not lived up to his predecessor. Who’s up next? We have no idea. Apple’s leadership page lists 16 executives who report to Cook, a remarkably flat management hierarchy given Apple’s size and complexity. The most visible executive after Cook, Angela Ahrendts — the former CEO of Burberry, and the only member of the management team besides Cook who had run a large company — left this month. Apple spokesman Josh Rosenstock pointed to the company’s corporate governance guidelines, which say that Apple’s board and CEO should “conduct an annual review of management development and succession planning for senior management, including the CEO.” He declined to answer further questions about the company’s succession planning. What point in time might that be? Cook received a stock award in 2011 that vests over 10 years. That grant alone could leave him a billionaire, a small payment for the favor of quadrupling Apple shareholders’ wealth. He hardly needs more compensation, and has shown little interest in the trappings of mega-wealth. But it seems significant that the board has not awarded him a grant that would signal to investors that he plans to keep the CEO reins beyond 2021. 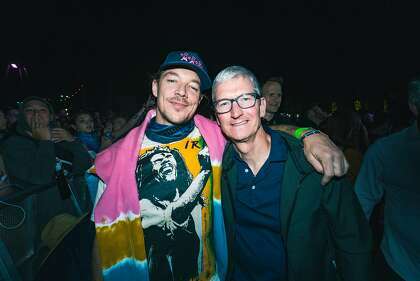 Honestly, I learned more about Cook from an Instagram photo that electronic dance music artist Diplo posted from the Coachella music festival than I did reading “Tim Cook,” Kahney’s earnest if sometimes fawning profile of the Apple CEO. Want to get the latest on Silicon Valley in your inbox? Subscribe to Tech Chronicle. But in one modestly revealing passage, Cook mentions his dislike of office politics. He famously fired iPhone software chief Scott Forstall, an abrasive leader sometimes discussed as a successor to Jobs. After Apple Maps flopped — a disaster begun under Forstall’s watch — Cook said his executives would have to work together, rather than fight for resources and favor, as Jobs preferred his lieutenants do. That approach has been rewarding for Apple investors. If Cook wants to keep running Apple, the job is likely his. But does Apple’s board have any choice? 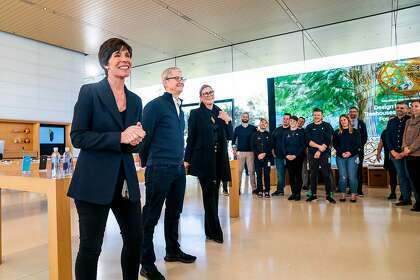 There are no obvious internal candidates to replace him, and it’s hard to think of an external candidate whom Apple’s insular culture wouldn’t reject. Forget inventing the next iPhone. Replacing himself is Cook’s most critical challenge. Pinterest is expected to go public this week, this year’s second big debut of a richly valued, privately held San Francisco tech company after Lyft. Also: Ramona the Love Terrier is holding an initial pup-lick offering. Next articleHow To Add Voice Search Into Mobile App?